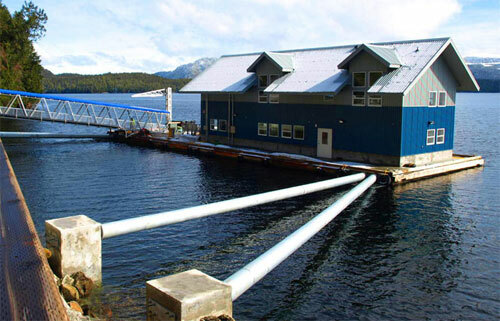 (SitNews) - The OceansAlaska Marine Science Center has barely opened its doors and tiny oysters are already growing out at the new floating facility at George Inlet in Ketchikan. The 28 acre site was granted to the non-profit by the state and Ketchikan borough in 2006. Economists believe expanding mariculture just in Southeast Alaska could easily increase the industry’s revenues over time from the current $7 million to more than $100 million a year. Australia produces 80 million oysters a year worth $40 million; New Zealand’s government -funded mussel industry went from $15 million to over $100 million in 20 years, and scallop farming at Prince Rupert and Prince Edward Islands in Canada is a $60 million industry. Alaska’s most far flung fishing fleet plans to catch lots of ‘small crab for a cause’ when the golden king crab season gets underway next month. Golden kings are caught in deep waters along the 1,200 miles of the Aleutian Chain, a part of the Pacific “Ring of Fire,” and the westernmost region of the United States. Goldens are Alaska’s most stable king crab stock, with a harvest this season of 6.2 million pounds. The remoteness of their home turf, however, prevents managers from surveying the stocks as often as they’d like. To safeguard the fishery, the fleet of five to six boats voluntarily uses gear with larger mesh than required by law to make sure all small crabs can escape. And therein lies the problem. To help solve the riddle, the fleet will use 20 test pots made with small mesh to capture the juvenile crabs. Alaska Department of Fish and Game scientists will a collect the data and return them to the sea. A $25,000 grant from the Bering Sea Fisheries Research Foundation paid for the test crab pots. The Aleutian Islands golden king crab fishery begins August 15 and can run through February. IFQ holders will have a tougher time with any appeals issues and it will all be dealt with long distance. The laws that govern fishing limited access privilege programs (LAPPs) include an appeals process for fishermen who are eligible to receive shares of the fish. LAPPs are basically limited entry programs such as Individual Fishing Quotas (catch shares) for halibut and sablefish and Bering Sea crab. “It’s nothing new to Alaska. It’s been happening for over 30 years with the Alaska limited entry commission,” said Phil Smith, a retired limited access manager at NOAA Fisheries in Juneau. Among other things, Smith devised the appeals process for IFQ programs that began in Alaska in 1995. “That was a massive program with 8,000 applicants and built into the system was an administrative appeals process to make the determination if people were not eligible for any IFQ, or for as much as they wanted. There was a formal opportunity for people to appeal in the Juneau office at NMFS where they were treated fairly and got full due process. We handled hundreds of such appeals, some frivolous, some with merit,” Smith said. Public comment on the appeals process ended June 9 and it may or may not make it to the law books. Smith said his advice is to pay attention.